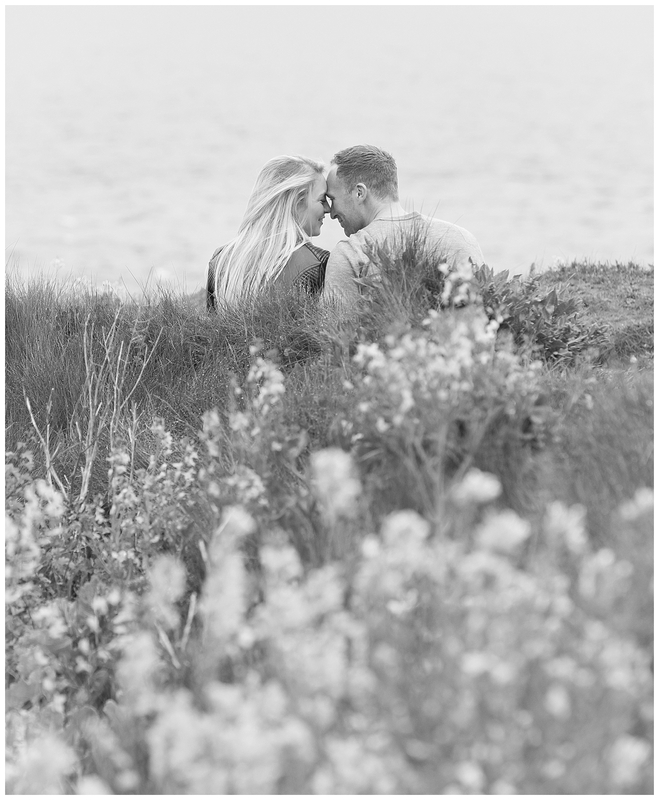 I was very excited recently to be asked to do a secret photo shoot capturing the moment Luke proposed to the beautiful Sian on top of Old Harry’s rock. He wanted me to capture the romantic moments without Sian knowing I was there. I happily rose to the challenge and started to plan my secret mission. It soon became clear this was going to be pretty tricky without the help of a decoy and boy was I right. So I enlisted the help of my wonderful husband who happily took the day off work (we both love any excuse to walk the Purbecks) and I needed someone to carry my kit! We arrived ahead of time in the pouring rain, not quite what we had planned, a quick text conversation with Luke assured me that he was still game so off we went to get in position, fortunately the rain stopped as we reached the top of Old Harry, about a mile walk from the car park, but the previous shower meant that no one at all was on the hills except us and our soon to be engaged couple who fortunately seemed oblivious to the crazy couple pretending to photograph the view, a flower or a bird or anything at all. My husband was posing for photos (very out of his comfort zone!) while I was shooting over his shoulder with a long lens desperately trying not to get rumbled. As Luke went down on one knee I was able to capture Sian’s reaction, by now I don’t think she would have noticed if a unicorn appeared on the rock. I was darting around up the cliff and down to get different angles as they opened a bottle of champagne and were lost in the moment. I then set myself down to shoot through some flowers scarily close to the edge of the cliff watched on by my slightly worried husband (he knows what I’m like when I’m “in the Zone” completely wrapped up in getting the perfect shot) By now we had some onlookers glancing over disapprovingly as I photographed the kissing couple from flat on my belly on the cliffs edge through the grass and flowers obviously thinking I was a little deranged – to be polite. 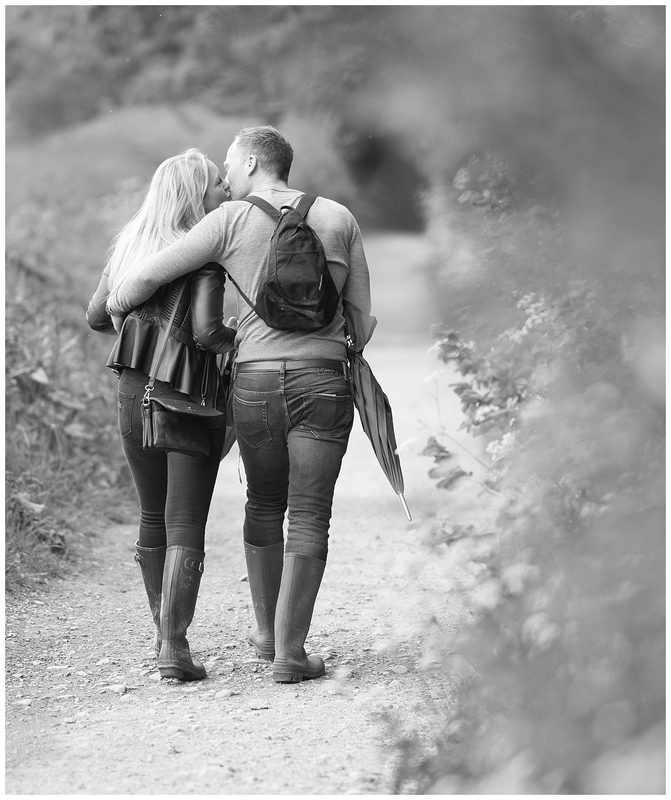 As the newly engaged, happy couple finished their champagne they headed back along the path back to “The Pig” where they were staying, we followed close by, still camera in hand hoping for one last kiss. As Luke walked by he glanced over with an appreciative nod and smile to us, as we breathed a sigh of relief that we appeared to have got away with our strange behaviour undiscovered. We then headed off home to edit the photos. I was so pleased with the images and also that Lukes’s secret photography mission had remained just that. Luke gave Sian some of the printed images to her for her birthday as a surprise. What a lovely thing to do.